Paris was actually a city that Dave really wanted to go to, and I didn’t care about. 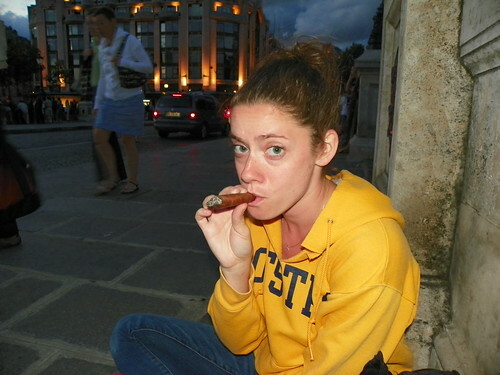 Thinking back on it, I don’t really know why I was ambivalent about Paris… I must have had a reason. Oh well. We arrived in Paris in the early evening and immediately asked the hotel staff about seeing a doctor. I felt on the train over from Amsterdam ear was not getting any better and that an ear infection was imminent. Knowing my history of ear infections, I needed amoxicillin, or I would NOT be a happy camper. The hotel staff was super nice, and told us they would have an English speaking doctor come within the hour. We belted down some McDonald’s (hey – we were in a rush!) and got me some drugs. (Let’s just talk about how all 3 prescriptions the doctor gave me cost only 18 Euro… TOTAL. Insane.) 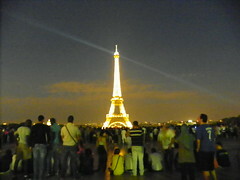 Since it was still early enough in the night, we decided there was no better time to head to the Eiffel Tower!!! On the 2nd level… still a long ways to go! We were kind of annoyed when we got to the 2nd level at the sheer disorganization that the staff there had. They closed the ticket booth (for the higher levels) because they needed to let people come down from the top first to make room. Understandable, but there was no one in charge to tell people this at first, and then no clear line for the tickets, people didn’t know where to go to go up or down, it was a general mess. C’est la vie. We finally made it up to the top and although very cramped, the views were spectacular. As it got darker, Dave and I watched a bit of chaos happen down in the Fan Park, and decided to hightail it to the metro before bedlam broke out. 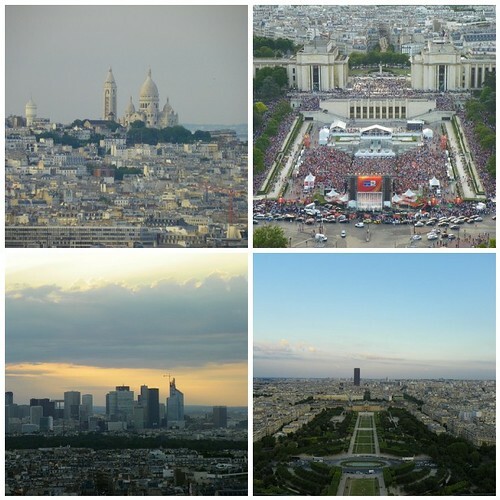 (Surprisingly, at least to us, it seemed like all of Paris was rooting for Spain. I thought it would be fairly split, but guess not!) We ran for the subway, but not before getting some great shots of the Tower glowing at night, and video of the hourly light show! 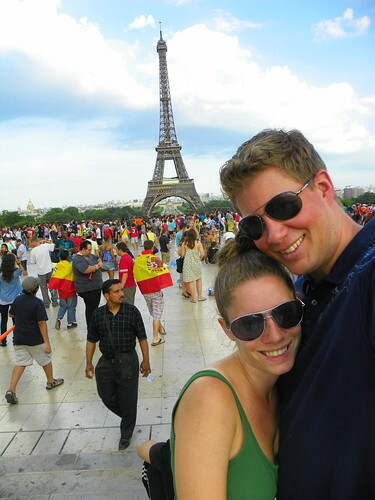 I realized that we took more pictures in Paris than in any other city (322! 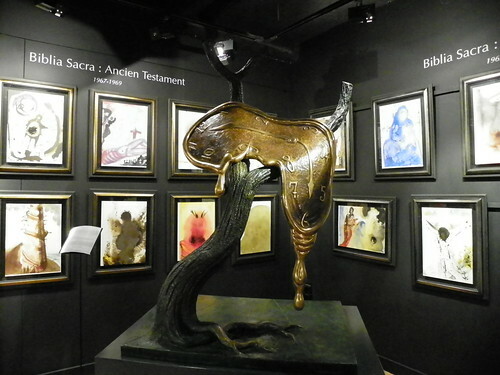 ), but there was just so much to see! 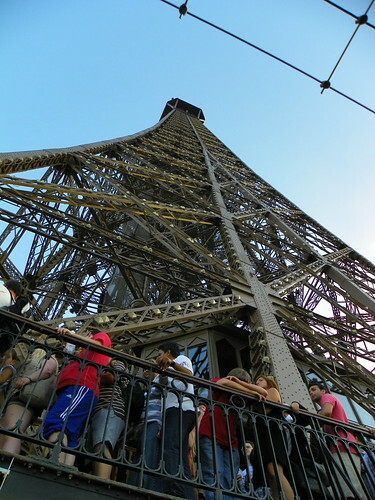 (And so many pictures of the Eiffel Tower to take!) 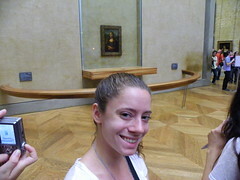 We spent the rest of our time in Paris exploring the Louvre, and hunting down the Mona Lisa (so small!) 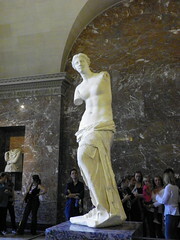 and Venus de Milo. I had to FIGHT people to get close to the Mona Lisa – the crowds were insane! We continued to run around the city, going through all the covered markets, eating delicious crepes and trying to find every space invader we could! (The space invaders are put up by a street artist all over the world. 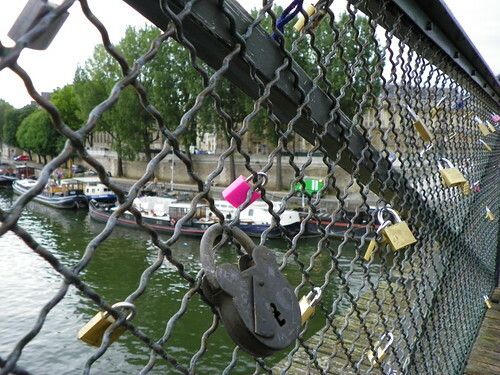 Once we figured out that we had seen them in New York, Amsterdam and now Paris, we looked for them wherever we were!) 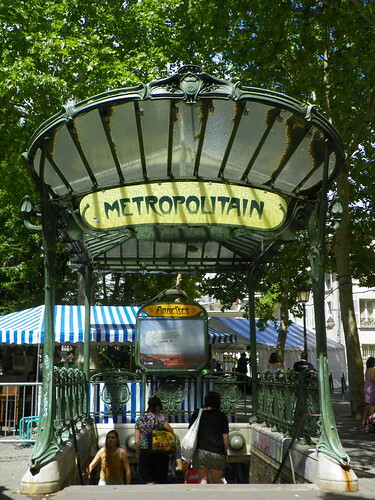 One of my favorite days was when we took the metro to Montmartre. The little town was what I had expected Paris to be, with all cobblestone streets, and little shops and cafes everywhere – not a major chain store in sight! The main purpose of our excursion out there was to climb to the top of the church for some more gorgeous views of Paris, and to have a Parisian lunch on the grassy hill overlooking Paris! 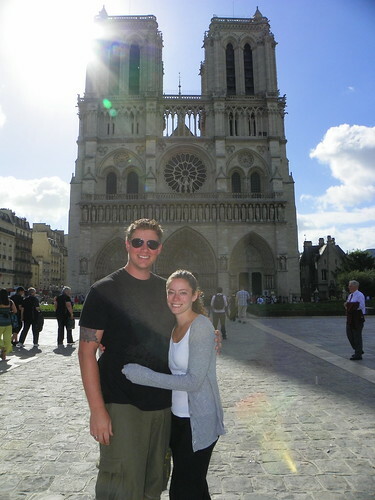 And last, but not least, the Notre Dame! We went early in the morning, to avoid the lines (and good thing we did – they were pretty long when we left!) 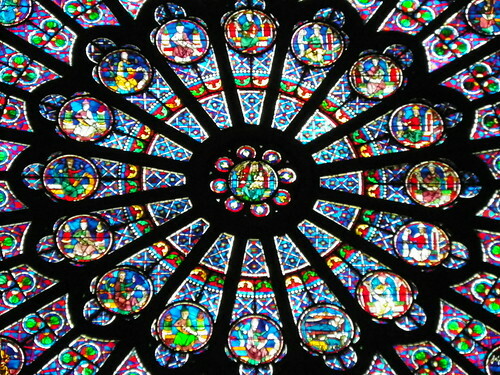 and although it was cold and windy, once we were in side, we were blown away by all of the stained glass and architecture. And that was our trip!! Ta-da! We didn’t get to do everything we wanted to in Paris, but I’d say we covered a lot in the time we were there. 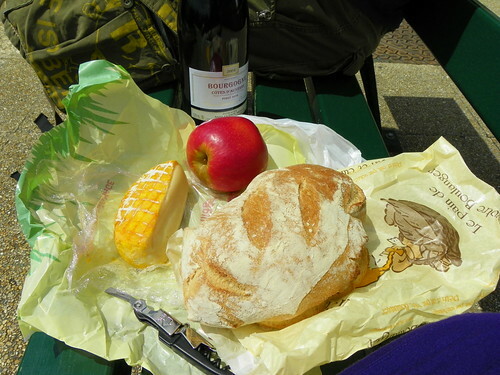 I’d love to go back to France to explore other parts of the country.. especially the wineries… mmmm wine. 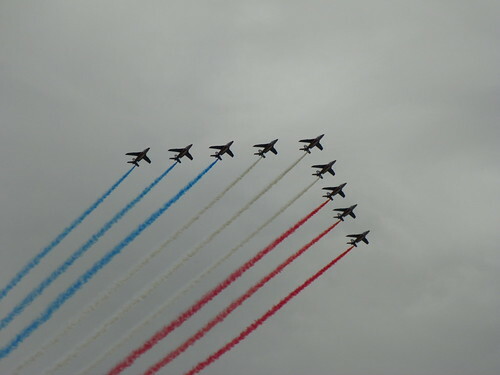 Anywho, here’s some more pictures of Paris to round off our trip!! I love how their subways look! We stumbled past a fashion shoot! Ahhh, this post brought back so many awesome honeymoon memories! Notre Dame was our favourite place and I loooooved the Nutella and banana crepe 🙂 I want to go back! looks like you had a great time and Paris looks beautiful. 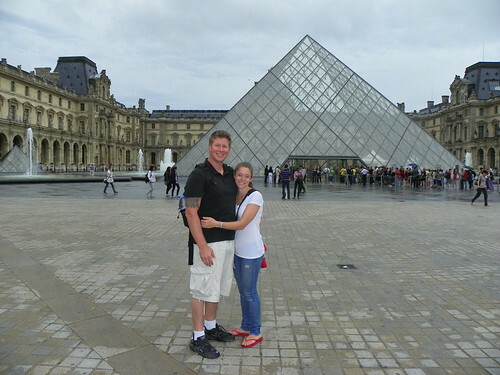 All I can think about when I saw the pic of you two in front of the louvre is The DaVinci Code… HA HA!!! 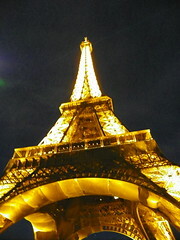 I want to go to Paris now!! It looks like you all had a great trip! I loooved living vicariously through you (until my trip in September!). These pictures look straight out of a travel magazine, so perfect! I am kind of jealous. I thought I would never care to travel, but your pictures might have convinced me otherwise. Gorgeous photos! 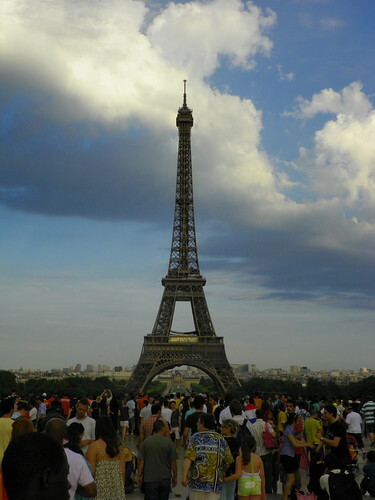 I can't wait to go back to Paris one day. Looks like so much fun! 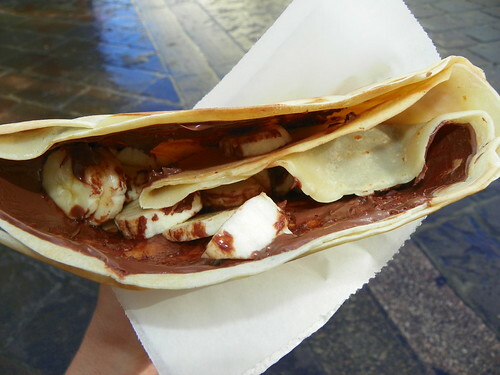 ahhh this post made me miss France so much! I am glad you guys had such a great time! When I went I wasn't too excited to see Paris either (I have no idea why) but I found myself awestruck by its beauty-I can't wait to go back. 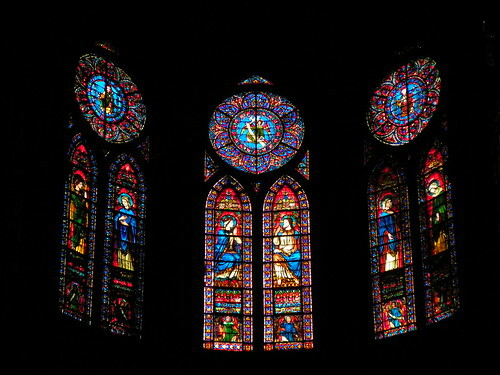 Gorgeous photos; a few of them made me all teary-eyed because I *so* want to go to Paris someday. Thanks for sharing! You and Dave are such a freakin' cute couple. I know that bread, wine and cheese will be my diet of choice when I'm there. Someday, anyway. I'm so sorry that you got sick, but hooray for cheap drugs!